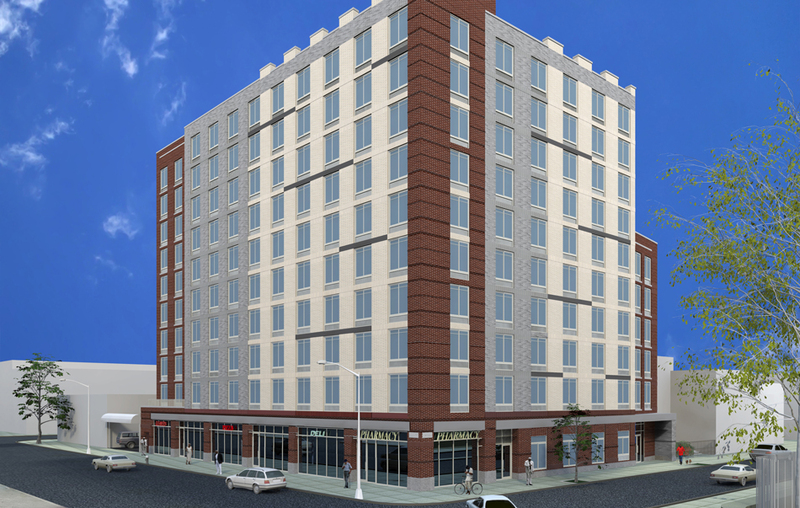 Linwood Park is a 10-story affordable housing building developed by L+M Development Partners and B&B Urban, located in the recently re-zoned Atlantic Avenue corridor in East New York. The approximately 105,000 SF building contains 100 apartments as well 3,700 square feet of community facility space. The project includes 30 units of supportive housing for formerly homeless families with services provided by the non-profit HousingPlus, as well as 10 units of affordable housing for families earning under 50% of AMI and 59 units of affordable housing for families earning under 60% of AMI. Residential amenities include an on-site superintendent, a community room with kitchenette, computer lab and children’s library, fitness room, laundry room and landscaped outdoor space. Designed as a green building, Linwood Park Apartments will feature a photovoltaic solar installation and energy efficient appliances.